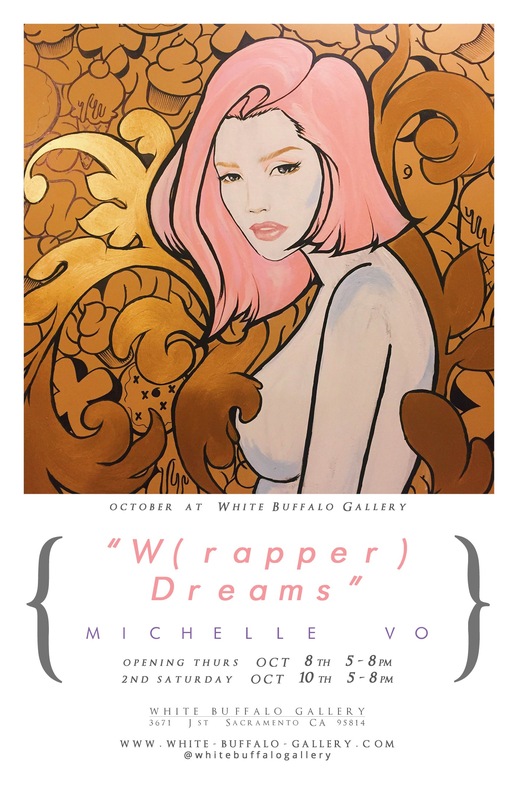 White Buffalo Gallery is excited to present “W(rapper) Dreams” art of Michelle Vo for October running until November 7th. Drawing has been that childhood hobby that always seemed to linger. It’s partly why I find myself hesitating to call myself an artist because I’ve always seen what I did as a way to kill time. But over time, I can’t deny the fact that art is more than just a childhood hobby. It’s what keeps me lowkey sane when I’m forced to put priorities in check. Going to school full time or working that 9-5 state job has definitely made me a daydreamer. My artwork is heavily inspired by people, curves, playfulness, and memories that cross my mind during those mundane hours of my day. “W(rapper) Dreams” as my first introduction as an artist is almost like wishful thinking. The thought that maybe I’m being too unrealistic, but it’s something that I hold on to because it keeps me motivated to continue doing what makes me happy.